You are here: Home>Archive>Days of Pride Collection.>Collection of items relating to Arthur Lewis Lloyd.>Letter from Private John Martin to Mr W.H. Lloyd. Letter from Private John Martin to Mr W.H. Lloyd. 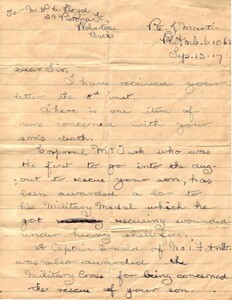 Letter from Private John Martin to Mr W.H. Lloyd dated Sept 13 17. It says that Corporal McTurk has received a bar for his Military medal and Captain Donald was awarded the Military Cross for the rescue of Mr Lloyds son. It has been written is response to a letter from Mr Lloyd and also mentions the casualties that have occurred in the last 12 months.